Interesting indeed. I suspect that the float valves would provide a fundamental obstacle to using the stock carbs. Are you aware of any carbs that are designed for operating in this pressurised environment and are available in a suitable size for a bike? 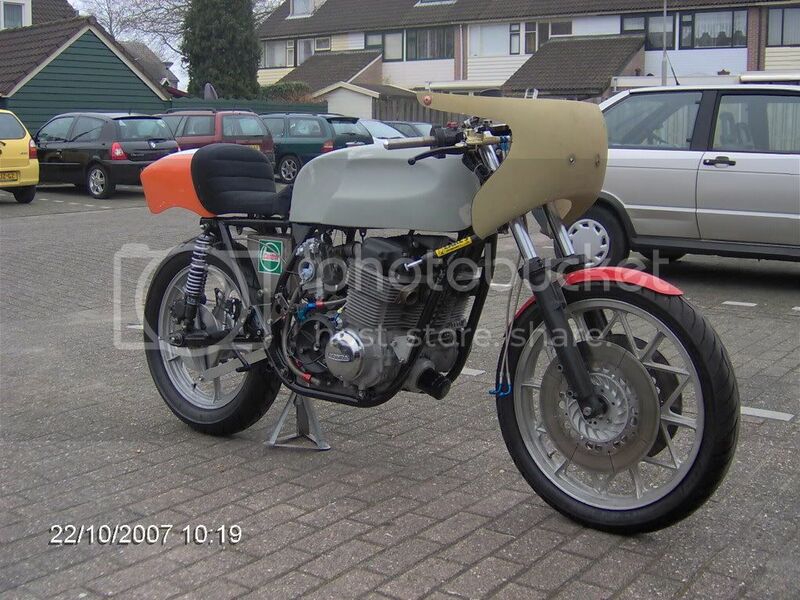 First I was thinking about a blow-through system and thought of using the carbs of a Yamaha Fazer 600. Think they are suited for this kind of environment. But then I decided to go for really 'Old skool'. 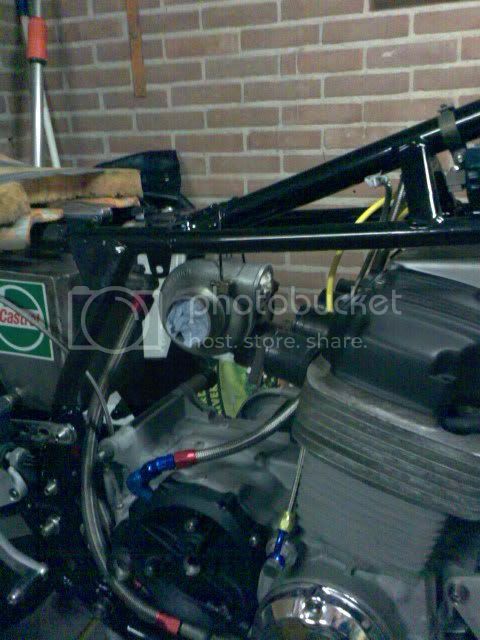 While I'm busy with my other projekt, the JAPAUTO replica, Iam still trying to do some work on the Turbo bike. It's getting there, slowly but surely. Just wanted to update where I am at with my turbo build. My motor is built and in the bike. I used a domed 836 kit, DOCH rods, F2 Head and Cam. Measured CR is 8.1:1. Motor is in the bike and I am using a set of 1985 CB650 CV carbs. So far I am in the middle of tuneing the carbs. The came with 115 mains and 35 slows. I have bumped the slows to 40, and the bike is drivable with a 4-1 exhaust on it. The motor is very crisp, so a 8:1 CR ratio doesn't seem to take a noticeable amount from the low end. This bike is much quicker than my stock 750k5. I have a IHI turbo that is going to mounted in a blowthrough set up, with a IC, interestingly the IC has a small blow off valve all ready mounted on it. The turbo is going to be mounted in the front of the bike. The 650 carbs I am using are sealed all ready, I pressure tested them with a hand pump to 12 psi and I did not get any leaks. For fuel I have a riseing rate regulator and a low pressure fuel pump. Right now I am fabing the intake manifold, them the I need to get a exahust manifold made. but things are progessing. It has a sealed swing arm that is used as the oil tank. plus a bunch of other mods. Your Pics look really good. I am fascinated with the swingarm oil tank. The rear brake like looks a bit precarious to me, but maybe it is routed better than can be seen in the pic -- either way, with the amount of work you have in that bike, I probably do not need to say anything. Oil in the swing arm, that's a new one (and a good one)! Oil-in-frame was and is popular especially with spine frame designs, but oil-in-swingarm is really interesting. What size are the CV carbs? Great pictures, and great work by the way! The carbs are 32mm CV (only the 1985 bikes had them, the 1983/1984 where 29mm) The bike is the smoothest reving 750 I have ridden. Alot of people don't like CV carbs, but in my book these things are a major upgrade. Super smooth throttle action, easy to tune, easy to clean, easy to access on the bike, the floats never need to be adjusted and they seal great. Plus alot of parts are still available for the. Over the years I have come to hate the carbs on the 1st gen 750's. Nothing but one headace after another. The brake line is a little harry right now, I am still trying to get everything on the bike, and shaken down before I disassemble and make it all pretty. I had a whole bunch of braided lines from a couple of vf500's i bought, (which also contributed the front end and the swing arm for the bike) and the one I used for the rear break is a little long, I need to bend the banjo bolts a little to get it to lay flat. The only problem so far with the swing arm is determining how much to fill it. My gut said fill it to the brim and let it go from there, but it was wrong. You would be surprised how much surge the dry sump puts out on high revs. right now it is about half full and things are working great. I get some oil in the expansion tank when I take the bike to red line and back to idle, but thats why its there. My biggest hurdle at the moment is that the 30 year old fiberglass tank has a ton of varnish/residue in it, or the liner is breaking down. Either way, I need to reseal it asap. The bike is a blast to drive as is though. People look at it and have no idea what it is.